Tottenham have been preparing for their crucial game away at Liverpool by training at their fresh home White Hart Lane. Midfielders Eric Dier (hip) and Harry Winks (groin) out for the clash at Liverpool this weekend. Serge Aurier (hamstring) will be assessed. A modern, sleek sports stadium of magnificence that has surely made the delay all the more worth it as the players bask in the Friday morning sunshine for a routine training session. 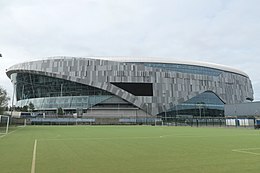 The view towards the ground’s South Stand is a mixture of beauty and perfection, 2 words reflecting the tactics of Mauricio Pochettino’s football. The fans won’t have to wait long as they prepare to watch the team play their initial game in their new surroundings against Crystal Palace on wednesday at 7:45 PM BST. there's also a 30 minute opening ceremony before kick-off.